PHUKET: Vice Governor Dr Sommai Preechasilpa has denied rumours that she will deliver a speech on the stage erected by anti-government protesters on the Sanam Chai playing field opposite Provincial Hall. Dr Sommai is going to the protesters’ gathering ‘only to listen and monitor’. Meanwhile, Dr Sommai's place of work, Phuket Provincial Hall, remains closed and Mr Amnuay said the protesters will be busy today, visiting oter government offices on the island to “request” them to close. Mr Amnuay Kumban said, “Yesterday we just succeeded in getting several offices closed. Today we will go to more to ask them to close as well. 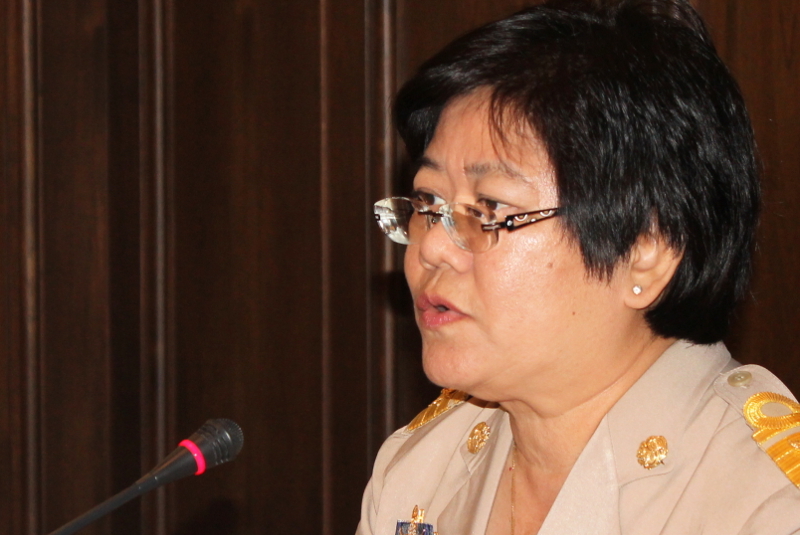 The Chief of the Phuket Provincial Employment Office, Yaowapa Piboonpol, told The Phuket News today, “The office has been closed since yesterday but we can still help people. We have posted the contact numbers of the heads of each department on the door, so people can call us if they need help. “Please call Thanadetch Karaked at 089 511 1665 if you need help on work permits, apart from permits for Laotians, Burmese and Cambodians. Both Phuket Immigration Office and the Land Transport Office are currently open as usual.